You are here: Home / Blog / What Does the Omnibus Spending Bill Mean for Public Lands? Last week, lawmakers passed the omnibus spending bill, a massive $1.3 trillion package that determines how the federal government allocates funds. Several key advancements for our public lands are among the far-reaching provisions of the bill. Protecting, and funding, our public lands is integral to our experiences as outdoor enthusiasts. Legislators on both sides of aisle came together to fund wildfire disaster relief, the Land & Water Conservation Fund, and some of our biggest land management agencies. From a public lands perspective, the bill is also notable for what it doesn’t include. A provision that would have undermined the Roadless Rule didn’t make it into the final bill. Thank you to everyone who joined our call-to-action and wrote their lawmakers on this issue! For a deeper dive into these measures, check out the summaries below. This one is a breakthrough: the omnibus spending bill sets aside $2 billion a year for the Forest Service to tap when wildfire costs are above average. Historically, fighting a disastrous wildfire forced the Forest Service to take money from other programs, like recreation, conservation, and fire prevention. This fund puts an end to this unsustainable borrowing cycle and allows the agency to invest in the future of our national forests. This funding 'fix' will be of particular importance here in Washington State, where wildfires have wreaked havoc in recent years. In 2015, the president declared a federal emergency in a season where more than 1 million acres burned in our state. And in 2017, wildfires prompted Governor Inslee to declare a state of emergency. The Mountaineers has advocated for a wildfire spending solution for years, and we’re thrilled to see Congress take action. We appreciate Washington’s own Senator Cantwell’s leadership on this issue. The fund will take effect in 2020 and run for a 10-year period. During negations on the omnibus bill, Sen. Lisa Murkowski of Alaska attempted to attach a provision that would exempt lands in her state from the Roadless Rule, a key conservation tool used to protect our wild backcountry. This would have set a dangerous precedent for other states to do the same. The Mountaineers sent out a call-to-action, and more than 370 of you lent your voice to this issue. Our partners across the country rallied their communities as well. We’re happy to report that the Roadless Rule provision did not make it into the bill. Thanks again to everyone who wrote their lawmakers! Check out our call-to-action piece to learn more about the importance of the Roadless Rule. Under the omnibus, the Land & Water Conservation Fund (LWCF) – a crucial resource for stewarding green spaces across the nation – will be funded at a $25 million increase over last year’s levels. 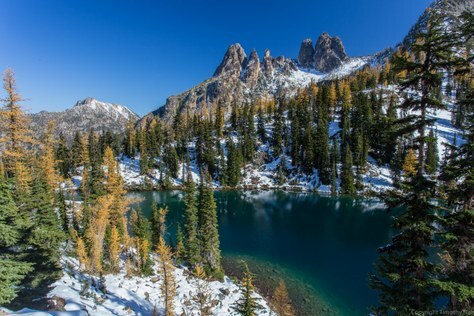 The bill includes specific allocations for locations near and dear to The Mountaineers, such as Lake Chelan Natural Recreation Area and Okanagan National Forest. The LWCF has been in a precarious position for some time now. Congress allowed the program to expire in 2015. Due to public outcry (thanks to all of you who joined our efforts), Congress issued a three year re-authorization. While we are happy to see LWCF funded at higher levels than last year, we must continue our work to make sure the program doesn’t expire this October. We would like to see LWCF permanently authorized and fully funded. We'll provide more information on how you can help defend LWCF as we get closer to the program’s October expiration. Some of our largest national land management agencies -The Bureau of Land Management, National Park Service, and Fish and Wildlife Service - will all receive funding boosts from last year's allocations. As we’ve shared in the past, when we invest in public lands, we steward our natural treasures and generate billions through the recreation economy. You can learn more about omnibus funding for land managers in this piece by E&E News.